On May 22, 2018, the report on China's private enterprises 'foreign investment and international economic cooperation sponsored by the China Private Economic International Cooperation Chamber of Commerce and supported by Beijing Taiyi Real Estate Group was held in the report hall of the Beijing International Hotel Convention Center. Party Secretary and Executive Chairman Wangyanguo of the China Private Economic International Cooperation Association attended the conference. The United Nations Messenger of Friendship, Chairman of the China Private Economic International Cooperation Association, President Fubiao, Chairman of the International Gongfu Federation, Chairman of the Bureau, and Taiyi, Chairman of the Beijing Wangyuyin, attended the event. Director Jiaoyi of the Department of Foreign Investment and Economic Cooperation of the Ministry of Commerce was invited to make a special report on the overall situation of China's foreign investment cooperation, the situation and existing problems, the current relevant policies and measures, and the relevant suggestions for enterprises. In recent years, according to the situation of foreign investment and trade of enterprises, our government has adjusted its policies in a timely manner, optimized the distribution of the international market, and maintained a good momentum of development in China's foreign investment, labor cooperation, and engineering project contracting. The Belt and Road Initiative offers new opportunities for overseas investment and trade by enterprises. In order to keep enterprises informed of the current state of China's foreign investment and trade, to grasp its foreign investment and trade policies and policies, and to keep abreast of the overall development of the Belt and Road Initiative, The China private economy international cooperative Chamber of commerce specially invites the ministry of commerce foreign investment and economic cooperation to make the special report for everyone and answer the question, in order to drive the masses of private enterprise to grasp the new situation, new trend and new development of global economic development to provide reference. Chief Jiaoyi, with his detailed data and vivid case studies, It has elaborated on the forms and scale of investment cooperation such as OFDI, outsourcing projects, overseas economic and trade cooperation zones, and labor cooperation with foreign countries. The Belt and Road Initiative has become the focus, the quality grade has been significantly improved, major projects have been actively implemented, and the results have become more and more remarkable. Features, the paper analyzes the situation, development opportunities and challenges, and interprets the relevant policy measures and suggestions for enterprises in strategic decision-making, cultural development, interest integration, cooperation awareness, risk prevention and so on. It also has an interactive discussion with the participating entrepreneurs on related issues. Director Jiaoyi's simple and easy to understand policy interpretation and answer questions were widely praised by the entrepreneurs present at the meeting. It has a very important role for Chinese enterprises, especially for private enterprises to go out to participate in the Belt and Road construction and international production capacity cooperation. In an interview with reporters, Fubiao said that the China Private Economic International Cooperative Chamber of Commerce has always promoted the great development and prosperity of Chinese martial arts. We are jointly committed to developing a market economy through martial arts culture and becoming a bright economic and cultural spot of the Belt and Road. Technology is the first basis for the development of any sport in the world; In the process of disseminating technology and promoting, publicizing, and developing, the economy is also the first basis for the development of sports. Without an economic basis, the development of any sports undertaking is difficult. Only when the economy is upgraded can our cause be realized, expanded and strengthened. I have summed up that there are three kinds of human forces: thought, culture, and spirit. Wushu is the combination of thought and body language, the combination of art and aesthetics, the combination of power and skills, and the development of the human brain and limbs in coordination with each other. It is a science and technology that bolsters the spirit and will of all mankind, the promotion of a country's culture can sublimate the idea of a nation; The revival of martial arts can boost the national spirit of a country. An ideological nation is a people with an ideal and a goal and a hope; A spiritual people, this country will become more and more powerful! To govern the country, to govern the government, to govern the family, are inseparable from the spirit of ideology and culture. Through the ideological and cultural spirit, we can enhance people's social responsibility, social influence, social visibility, social values, social image, social status, and personality charm, and finally allow people of all ethnic groups in the world to enjoy the health and happiness brought by martial arts! 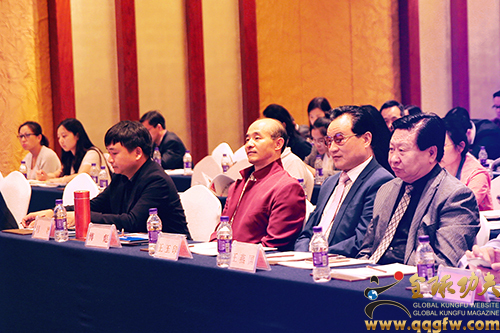 More than 200 representatives of the All-China Chamber of Commerce, representatives of some provincial and municipal industrial and commercial federations, vice president units of the International Chamber of Commerce, chairman of the presidium, member units, and members of the organization participated in the conference.